Watch our video on trainings, resources, and tools we have available just for administrators! Administrators play a special part in supporting students with ASD and other disabilities and particularly in supporting teachers and other team members to be effective in working with students with ASD and other disabilities. Because of this, we've created some tools and resources designed specifically with you in mind! The Performance Standards and Evaluation Criteria and corresponding rubric provide a framework for evaluation of special education teachers and programs as well as a means to plan for targeted professional development. Want an easy way to keep track of your trainings? Click here to access your personal dashboard where you can see what training options are available and track your progress! You'll need to create a free account and then you'll be able to access training opportunities by topics. Preview of the Foundations Course. 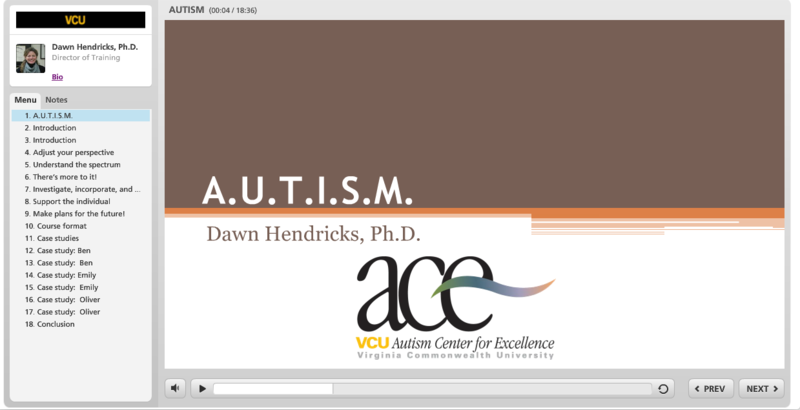 The VCU-ACE Foundations in ASD course provides information about the characteristics of ASD and is a great place to start learning about those with ASD. The VCU-ACE PARA Project provides professional development for paraprofessionals who serve students with autism spectrum disorder (ASD) and the teachers with whom they work. The Ask the Expert Series discuss important topics for educators by providing a very brief overview of the topic, discuss why it is important, and provide important tips that are relevant to the topic. These videos are a really good place to start, particularly if you are unfamiliar with a topic. Our How To Video Series are short videos that lets you see how to implement some of the strategies that are important for all students, and particularly those with ASD. These videos give brief explanations to remind you about important information and then provide video examples of the skill or practice. They are a great resource for teachers, paraprofessionals, and other educators.